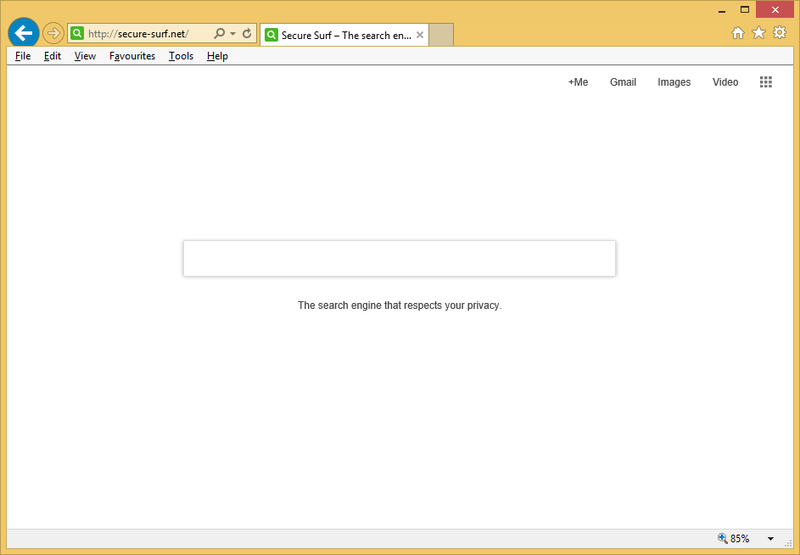 Secure-surf.net is one of those websites promoted as legitimate search providers. It tries hard to convince users that it is a search tool they can trust, but, to be frank, it is far from being a reputable search engine. Experts quickly realized that this website is not what it pretends to be. Instead of being a reputable search tool, it is a computer infection called a browser hijacker. This name has been given to this URL because it changes the settings on all web browsers without permission thus making web browsers automatically open Secure-surf.net. This search tool might be associated with a great deal of different problems, so keeping and, especially, using it as a tool for finding the information on the web is not recommended. You will find more information about the Secure-surf.net removal if you read this report till its end. Additionally, your all questions about this search provider will be answered in the paragraphs that follow. If you already see Secure-surf.net when you open your Mozilla Firefox, Google Chrome, or Internet Explorer, it means that your browsers’ settings have already been hijacked. You can undo those changes only by implementing the Secure-surf.net removal, and we recommend doing this as soon as possible because the presence of this untrustworthy search tool on your browsers might lead to the entrance of dangerous malicious software. This search tool will not start downloading bad programs on your computer even if you use it every day; however, those computer users who keep it and even use it every day risk clicking on untrustworthy search results shown by this tool. Untrustworthy search tools are those which promote third-party pages instead of taking users to pages with the relevant information. Because of their presence, we believe that Secure-surf.net could have been developed for the purpose of advertising primarily. It will not act very beneficially, so it is highly recommended to uninstall Secure-surf.net fully today. You will not regret getting rid of it because there are much more trustworthy search tools available out there on the web – you could set one after implementing the Secure-surf.net removal. How did a browser hijacker enter my computer? Your browsers’ settings have been altered because a malicious application called a browser hijacker has infiltrated your computer. These infections do not have official websites, so it is not likely at all that you have downloaded and installed this infection on your computer yourself. It is more likely that it has arrived bundled with third-party software when you have clicked on the Download button located on a suspicious third-party page. It does not really matter why it has been set on your browsers – you need to delete Secure-surf.net today. Read the last paragraph to find more. How can I remove Secure-surf.net from my browsers? Go to remove Secure-surf.net from all your browsers immediately after you find it set on them because it is not a legitimate search tool, for sure. There are two removal methods, i.e. a manual or an automatic one – adopt one of them to delete Secure-surf.net. If we were you, we would surely erase this browser hijacker automatically.